The romance of a hard-working band is undeniable. These are bands that never flag, no matter how many stages in how many cities they’ve sweated on, who above all else evince a percolating creative urge. That is precisely how to describe These United States. These boys from Lexington, KY and Washington, D.C. have become regulars in NYC and just about everywhere else in America over the past two years, bringing their Southern-inspired rock far beyond its natural borders. Along with nearly non-stop touring, they have been releasing albums like crazy, with two in 2008, one in 2009, and their latest, What Lasts this July. While they have undoubtedly lost a good deal of sleep in the process, what they haven’t lost is their generosity to their fans and their ability to give them a rowdy, spirited show. This late show at the Mercury Lounge was the second-to-last of their latest tour, but you wouldn’t have known it, with amiable frontman Jesse Elliott chatting up the equally chatty crowd. I am told that New York is one of the band’s favorite places to play, and if you consider the reception of at least vaguely kindred spirits (i.e., Southern rockers) like Kings of Leon and the Drive-By Truckers, it isn’t difficult to see why — New Yorkers can’t get enough of the sound of the South. I recorded this set with an excellent board feed provided by the Mercury staff, and the Schoeps hypercardiod microphones. The overall sound quality is outstanding, but the one caveat is so noteworthy I have to comment on it – a few songs, especially in the beginning, are marred by rude people talking. Consider that the amount of conversation you hear at points in this recording is recorded from highly directional mics that are eight feet in the air, mixed almost 50/50 with a source that has no crowd noise at all. Then consider how loud this would be to human ears in the crowd – or worse, on stage. A rock concert isn’t church – everyone gets that. But if you want to have a conversation, ignoring the band entirely, please show respect for both the other fans who paid to actually see music – and more importantly, the artists – and take your conversation to the bar or outside. Whether they actually tell you or not, it bums both the other fans and the band out to have their concert experience marred by someone talking loudly over the music. With that out of the way, enjoy! 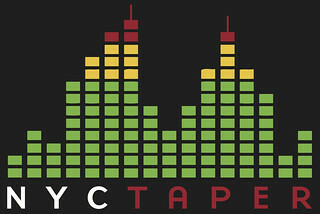 If you download this recording from NYCTaper, we expect that you will PLEASE SUPPORT These United States, visit their website, visit their MySpace page, and purchase their official releases from the buy.it link at their site [HERE].